“I always wanted to put something in Portland,” LaMike said. He considered opening a bar, but was attracted to the idea of a hometown brand, while emphasizing local ingredients and serving families. Besides the “variety of the surrounding businesses,” and being close to the Nike campus, LaMichael enjoys having a restaurant in Beaverton because of its community. “You can be who you are here and people are accepting.” He notes smiling, that Beaverton has adopted him. Like the other Killer Burger locations, Cedar Hills features local ingredients like natural beef from Fulton Provisions, and onions from Gill’s Onions. Beer taps include local favorites like Fort George and Ninkasi. There are gluten free and vegan options, as well as the best fries I’ve had at any Killer Burger location. 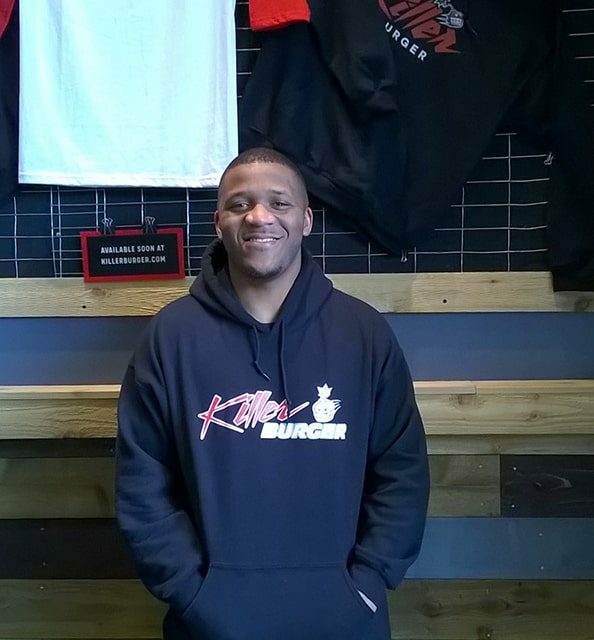 James’ background in football “helped tremendously,” in shaping his passion for the business. “Discipline, hard work, teamwork, everyone being accountable,” is observed by how he runs his crew, greets customers, and humbly busses tables. The ethic to work hard and lead by example, instilled in him by his grandma, shines through in the relaxed atmosphere of his Killer Burger space. LaMichael wants his Beaverton customers to know, “You’re going to have a good time,” at his restaurant because of the good food, good people, and chill vibes. Cedar Hills Killer Burger hours of operation are from 11am – 10pm every day and is located at 2905 SW Cedar Hills Blvd #105. For more information go to https://killerburger.com/location/cedar-hills/ or call 503-747-3069. Frances Quaempts is a Beaverton enthusiast who enjoys writing about its culture & food scene. PreviousHealth & Happiness: Parents Want Friends Too, but where to go? NextMeet Esha and Rumaisa, Super Kids! Beaverton Business (Catalyst Newsletter): Don’t wait!